Can I open the source code files if I don't have Microsoft Visual Studio .NET 2002 or later? I'm Win32 C programmer and I need to use WakeupOnStandBy code to write a program that wakes up my computer. How can I do it without MFC classes? I'm experimenting with WakeupOnStandBy app. It works great, except that on my Windows XP Home machine, the PC goes back to sleep again after 2 minutes. Is there a change I can make to the code that will wake the PC up in such a way that it will remain awake? I want to wake up my computer every day at the same time and then close it at the same time also. Can I use WakeupOnStandBy for that? I do not want to set the time every day. In other words, once set, will this software continue to be active every day? What if I want my computer on for only 30 min (example: wake 5:45am / sleep 6:15am)? WOSB loads up every time I restart my computer. How do I stop this? Is it possible to open multiple files at once? Do you have a source code available for Delphi programmers? How to force the scheduled event to happen right away? I'm using WakeupOnStandBy for a media laptop to display a photo album. However, when the computer wakes up from Stand-by, the screen is not active. Is there any way to automatically activate it? When [WakeupOnStandBy is] already running I need to change some parameters using command line. How can I do that? I have a PC in my car that is mini ATX (M2-ATX). When I kill the ignition (which signals the motherboard power switch) I want PC to go into Stand-by mode for a set time (say, 20 minutes) while I'm gone. If that time period passes, I'd like the system to hibernate instead. Is it possible to use WakeupOnStandBy for that? I have a walltop computer that I'd like to set up to run according to the following schedule: Monday through Friday: wake up at 7am, suspend at 9am, then wake up at 5pm and suspend at 11pm; Sunday: wake up at 7am and suspend at 11pm. Can I set up WOSB to do that? Is it possible to schedule multiple events? For example: Saturday: Wake up at 12:00 pm & run a program, suspend at 1:15 pm; then wake up at 8:00 pm & run a program, and suspend at 12:15 am (next day.) Sunday: Wake up at 2:05 pm & run a program, suspend at 3:15 pm? I did not see any mentioning that WOSB can run on computers with Windows Vista? Is it possible to translate your software [to any other language]? WOSB cannot wake up my computer from hibernation. Why? I'd like to wait a little before I run a program after WOSB wakes computer up from a suspended mode. How can I do that? Is this software compatible with Microsoft Windows Vista? I use WOSB to wake up computer to record TV. The problem is that when recording stops the PVR program continues to stream video. How can I close it? Can I start several schedules with WOSB at the same time? How do I check that I have the latest update to your software? I wrote my own code (as described in the Q4 above) and it can wake my system up from a stand-by mode, but not from hibernation. What am I doing wrong? Do you do custom programming/modifications of the WakeupOnStandBy software for our organization's specific needs? Can you explain how does WakeupOnStandBy wake screen up? I was wondering if it's possible to combine WOSB with one of your other programs, TOff? I don't need most of the WakeupOnStandBy's features. Is it possible to use it to do a task when computer wakes up from a stand-by/sleep mode (or hibernation) only? How do I completely remove WakeupOnStandBy from my machine? What is the correct way to submit a glitch/bug report? WakeupOnStandBy worked before but now it doesn't. I didn't do anything with it. What is going on? How can I become a beta-tester, or contribute to the development of this software? When I use hibernation repeatedly as the power saving mode my system becomes much slower. Why is that? How do I set up WakeupOnStandBy (WOSB) to work under Windows 7? I put my computer into a stand-by (sleep, or hibernation) using RUNDLL32.EXE PowrProf.dll,SetSuspendState and then set WakeupOnStandBy to wake it up, but my computer doesn't wake up. Why? I keep seeing "Wosb1.7.9.exe Error" referenced on the web. Is WakeupOnStandBy a virus or a malware? How can I translate the WakeupOnStandBy program to my language? What are the limitations of your free WakeupOnStandBy utility? 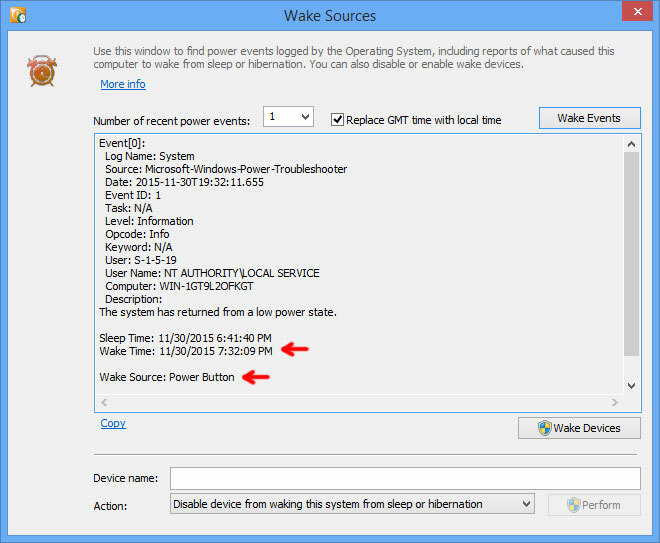 Why can't my Windows 8 device wake up on schedule (using WakeupOnStandBy software)? I upgraded to Windows 10 and now WakeupOnStandBy cannot wake my computer from suspension. How can I enable diagnostic event logging in the WakeupOnStandBy tool? Yes, although the source code files are no longer offered for this software. //i.e. sleep or hibernation, if supported. //signifies that the PBT_APMSUSPEND event was not broadcast. Of course, do not forget to release all objects that we opened above when you don't need them. Also make sure to provide a mechanism to stop the worker thread we started above when it is no longer needed. Please download the latest version of WakeupOnStandBy to fix this problem. Use "Prevent standby/hibernat." option to prevent it. This behavior might be caused by your OS settings that cause the system to go into stand-by again after a certain time of inactivity. To check go to Start -> Control Panel -> (Switch to classic view) -> Power Options -> Check settings under "Settings for Home/Office Desk power scheme" group. Let me ask first, by saying "close" do you mean "send into stand-by mode or hibernate"? If yes, than it is possible. Starting with version 1.7 WakeupOnStandBy incorporates this option in its main page. It is also possible now to save settings in a .BAT file right from the main window so that you don't have to enter everything again. Please read the manual for more info. wosb.exe /run /systray time="5:45 am" standbywait="30:0"
After WakeupOnStandBy switches into system tray (next to the Windows system clock), you can send your computer into sleep mode. WakeupOnStandBy will wake it up at 5:45 a.m. and send it back into sleep again after 30 minutes. WakeupOnStandBy does that if it runs in Repetitive Mode (i.e. the mode when you instruct it to run everyday or on certain days). To cancel this mode locate the icon of the WakeupOnStandBy on the system tray (next to the Windows clock), right click it and select Exit. When asked to confirm, select Yes. Watch this screencast for more info. Yes, absolutely. Watch the screencast here. Simply use command batch file and you can run as many files as you want. You can put as many files as you want. Make sure you put each program on a separate line and precede it with the start command. In case you want to include a path for the file, put it into double-quotation marks and omit the start command. When you're done, save it in the batch file. Make sure to change the file extension to .BAT while saving. After that you can include this batch file in the "file" command line parameter for WakeupOnStandBy. No. We do not provide source code for this software anymore. Download the latest version of WakeupOnStandBy. Then run it and click "..." button next to the Start button, and select Perform Now and then pick the type of a power operation. You can also use another software product. Download TOff that will do just that. Yes, there is one. In the version 1.6.2 we've included new options: "Turn on monitor and resume from screen saver" and "Keep screen on afterwards". Check those boxes (or use /screenon and /keepscreenon parameters if run from command line) to activate the screen. This option has its own limitations through. When run in Windows with multiple accounts, or if a single account has a password protected screen saver, you will have to log in before you can see your photo album. Read manual for more info. Since version 1.5.2, we've included a new command line parameter, called /closeall. Run WakeupOnStandBy with it to close all existing instances of itself. After that run it again with new parameters. We suggest that you read WakeupOnStandBy on-line manual here for detailed explanation and samples. Also watch this screencast. First, let me mention that by implementing this method you will save greatly on time necessary to restore your system from hibernation every time you kill the ignition switch. (The time necessary to bring computer back from hibernation could very from several seconds to up to a minute and more - and as you can imagine this could be quite annoying!) On the other hand, restoration from stand-by takes almost no time, but that mode could really take a toll on your car battery if you keep it on for a longer time (like overnight, or even for several hours), thus we are forced to use hibernation, or even shut-down. The solution can come from a simple set-up that will put your in-car PC into stand-by mode first, and then, if you did not start engine within a certain amount of time (say, 20 minutes in this case) the system will briefly wake up and go into hibernation that in turn will not discharge your car battery anymore. Advanced Power Management (APM) in PC to be able to delay power-off for at least the time period required for system to stay in stand-by mode (20 minutes in this case). If this option is supported, set it to at least 30 minutes for this question. Your hardware should support stand-by mode and hibernation. Download WakeupOnStandBy archive file from our website and unzip wosb.exe file, say, into "C:\" folder. Now your system should be set up. To remove this functionality edit out the line added in item 6 above. INFORMATION: Please note that this web site is not affiliated with any in-car software products, and we cannot answer questions regarding it. Since version 1.7.10 you can accomplish this by setting three separate schedules with WOSB using three instances of the program. Refer to question 23 below for more info. And watch this screencast for a demonstration. Since version 1.7.10 you can accomplish this by setting several separate schedules with WOSB using multiple instances of the program. Refer to question 23 below for more info. And watch this screencast for a demonstration. Please refer to question #21 below. Please refer to the question #38 below. Check that you have the latest version of WOSB before you begin testing. You can download it from here. Make sure that you set the wake time in WOSB correctly. Also make sure to give it some leeway before hibernating your system. Give it at least 5 minutes before sending it into hibernation for a scheduler unattended wake event later. Sometimes rebooting your system will help clear up memory and reset system processes that might have prevented hibernation. Refer to question #34 for more details. Some older computers do not have required hardware for waking up from hibernation even though they may support it. In this case there's only one solution - upgrade! If your computer has more than 4 Gigabytes of RAM, the hibernation may be disabled by the Operating System. There's an ambiguous Microsoft article KB888575 that deals with this issue. From our experiments, we were able to hibernate just fine many of the Windows systems that had more than 4GB of RAM, although some systems refused to hibernate. There's no clear indication why Microsoft decided to block hibernation on systems with more than 4 GB of RAM. Our guess is that flushing and then reading more than 4 GB of data to a conventional (spinning) hard drive (that's what happens during hibernation) may take a significant amount of time and thus may not be very practical. Although doing this with a Solid State Drive should not be a problem altogether. It is not known if the OS tests the boot drive's read/write speeds before disabling the hibernation. All-in-all, more research needs to be done before any conclusions are drawn on this topic. Check the Power Options window in the Windows control panel (go to Start -> Control Panel, then click on "Switch to classic view" and double-click Power Options). For Windows XP: Inspect the Power Options window tabs regarding any mentioning of hibernation. It should be enabled and allowed. For Windows 7/8: Inspect power plan advanced settings and make sure that sleep and hibernation are allowed. You may also check FAQ #35 to see how to manually enable wake timers. Many laptops and notebooks have the ACPI feature disabled when they are running on a battery power. (You may want to check your laptop's BIOS/UEFI documentation for more info.) This is done by default to prevent a total discharge of the battery since small amount of electricity is used to power the wake timers. IMPORTANT: WakeupOnStandBy may write to your hard-drive and System Registry to save its settings, or to perform functions in the Repetitive Mode. If you block any of these operations, WakeupOnStandBy will not be able to execute the tasks correctly. IMPORTANT: WakeupOnStandBy will require the Shutdown privilege. Without this privilege it will not be able to perform power operations on schedule. INFORMATION: Keep in mind that a program may still be running even if you don't see it on the screen. Your best bet would be to uninstall the software for the time of testing & reboot your computer. If the above options did not help, you will need to check your BIOS settings. To enter into BIOS editing mode check with your hardware documentation. For many systems you will have to restart computer. Right when it begins booting up you should see a quick prompt for a keyboard sequence needed to enter BIOS. In most cases you will have to hit Del or F2 keys repeatedly. While in BIOS go to Power Management Setup and check that ACPI Function is enabled. Also check that programmatic waking up from power state S4 (or hibernation) is supported and enabled. This could be labeled as "Alarm Resume" as well. WARNING: Changing BIOS settings may render your system inoperative and prevent Windows from loading correctly. If that occurs always memorize previous BIOS settings to be able to revert to them in case of a fault! In some cases a BIOS update could be recommended. IMPORTANT: Make sure to download a BIOS update and a flashing utility only from the web site of the manufacturer of the computer system! Most often computer makers issue BIOS updates with better power-saving capabilities over time, thus an update can improve your system's performance. WARNING: BIOS flashing operation should be performed only by a knowledgeable person. If done incorrectly it may render your computer inoperable! WARNING: In case of a "bad BIOS flash" your computer may become inoperable! Always follow instructions supplied by the manufacturer. Besides the BIOS update mentioned above, the update of the chipset, video card and other motherboard-related drivers could solve the issue. The problem in this case may come from an outdated manufacturer's driver, or drivers. This may happen when one of the automatic Windows updates that are issued weekly by Microsoft could prevent the initial manufacturer's driver to function to its full capacity. To make matters worse, many people believe that automatic Windows updates will also install any updates to the manufacturer's drivers, which in many cases is not true! Those updates must be performed manually. IMPORTANT: To download and install the manufacturer's drivers update check the make and model of your computer. Then go to the computer manufacturer's web site and use the make and model to look up available driver updates. WARNING: Download and install driver updates ONLY from the manufacturer's web site! If you're not sure where a certain driver comes from, DO NOT install it! WARNING: Driver updates should be performed only by a knowledgeable person. If done incorrectly it may render your Operating System inoperable! Make sure to follow exactly all instructions supplied on the manufacturer's web site! In some cases the hibernation itself may fail because the Windows system partition is not the active partition. This issue has been reported to us from users running WakeupOnStandBy program on Windows 7 computers (but it may also affect other Operating Systems.) This may happen especially if you copied, or cloned your hard drive after the hard drive upgrade. The symptoms in this case are that the computer appears to begin entering the hibernation only to remain in a "black-screen mode" until a mouse is moved, or to bounce back into the logon screen. The resolution in this case seems to be to set the system partition as the active partition through the Disk Management tool in Windows. There's also this and this support threads that may address the same issue. WARNING: Changing any settings affecting your system partition is a potentially dangerous operation! Make sure to make a complete backup of the data on your computer before you proceed with it! If you have a laptop computer or a portable system, you may have some additional settings that you'll have to look into since any system with a portable power supply will be more "power conscientious." and have hibernation disabled by default. Your BIOS/UEFI settings might include additional power saving options. It may also depend on how you hibernate your system. To make sure that you do it the way WOSB expects you to: hibernate it using the "Hibernate" option from its main screen's "..." button, then "Perform Now". Make sure that "Disable all wake-up events" is not checked. In case you have another solution that worked for you, please share it with us and we'll include it in the list above. Save this file to a disk, giving it the .JS extension in the Notepad's save window. Specify this file in the "Run the following file/program/web page" in WOSB. Yes, version 1.7.10 was designed to be compatible with Windows Vista. IMPORTANT: All previous versions of WOSB were not compatible with Vista! If you have an older version please download an update from here. where, <IMAGE_NAME> stands for the name of the executable file of the program. Example: To close Notepad, use /IM "notepad.exe"
INFO: In some cases you may need to forcefully close the program. In that case add /F parameter to the end of the ones specified above. Warning: The use of this parameter may lead to the loss of data in the program being closed! The latest user interface of the WOSB software allows to run another instance of itself using the Ctrl+N keyboard shortcut, or by right-clicking its main window and by selecting "New Schedule." Click "Create Multi-Session Link" and specify location to create the link that you will use later to start more than one instance of WOSB. Close current instance of WOSB and use the link created above to start it again. Set the first schedule and hit Start. To add another schedule, start another instance of WOSB using the multi-session link created above, set the schedule and start WOSB. You can run up to 256 simultaneously running schedules with WOSB in this mode. WARNING: The "Keep screen on afterwards" feature will have no effect if used in the instance of WOSB that is run in the Multi-Session Mode! It is recommended not to use this option in this case. WARNING: Overlapping schedules may adversely affect and in some circumstances even deadlock your computer! Use caution when running WOSB in the Multi-Session Mode! Since version 1.7.10 it is very easy to do. Start WOSB if it is not already running, then click the "..." button next to the Start button (or right-click its icon if WOSB is minimized to the system tray next to the Windows clock) and select "Check for updates". This will open our web page that will inform you if you have the latest version of the software. INFORMATION: Internet connection if required for this feature to work. You're not doing anything wrong. If your code can wake up your system from a stand-by mode but not from hibernation, it means that waking up from hibernation is either not supported by your system, or it is not enabled in the ACPI settings. Check question 19 above for more details. Yes we do. Moreover the current version of the WakeupOnStandBy software available on our web site for free was designed to provide basic power saving capabilities for home and small office users only. If you're a corporate or an enterprise user, that solution will not work for you due to its limitations. (More details can be found here.) We provide a paid service to customize the WakeupOnStandBy program's functionality for your company's specific needs, or even program a new module according to your specification. Please contact us via feedback for more information. INFO: This is a paid service. The simplest way to implement this on older systems was to send the WM_SYSCOMMAND message with the SC_MONITORPOWER notification. Note that this method is not documented by Microsoft and should be used only on older systems. // is currently working with the system and thus we should not do any "false"
Visit TOff page here, download and install the toff.exe file somewhere on your system. What to do: Set to "Hibernate Computer (Soft)". Set checkbox for "Mouse & keyboard inactivity period". INFORMATION: If this option is not available you will need to set it up in Settings -> Page 2 -> Computer Inactivity Timer -> Consider activity as -> Set to "Mouse & Keyboard Activity". Set Hours to 1, and Minutes and Seconds to 0. Set checkbox for "Network inactivity period". If your network adapter is not displayed in the window below, click Add Network button and select a network adapter that you'd like to monitor activity on. Set checkbox for "Minimize to system tray when set". Click on the "..." button next to the Set button, and select "Save & Open As .BAT File..."
Provide a file name for a temporary file (you will delete it later) and click Save. Highlight the part starting from the word /run all the way to the white-space on the line below. Right-click your selection and select Copy. Close the notepad window; delete the .BAT file you created above and close TOff. Run WOSB and set time control in item (1) for 9 a.m., and uncheck the date control. Check "Turn on monitor and resume from screen saver" if you need to wake up screen at 9 a.m. as well. Check "Repair network" if network connection is important at the moment when computer wakes up. Check "Run the following file/program/web page when computer wakes up:"
Click on the "..." button on the right off the file path for the item (2), and select the toff.exe file that you downloaded and ran above. Click Open. In the "(4) Repeat these tasks" section check days that you'd like to wake your system up at 9 a.m. Check "Switch to tray" to remove WOSB off the screen. Click Set button. You're done! Now put your system into a suspended power state (Sleep/Stand-by mode or hibernation) and wake it up to activate the sequence we just programmed. INFORMATION: To deactivate the sequence above, first find the TOff icon in the system tray bar, i.e. next to the system clock, right click it (if TOff is there) and select Exit. Then locate the WOSB icon there as well and select Exit. If WOSB issues a warning about being in Repetitive Mode, click Yes to exit it. Set the date field in item (1) to some very distant year. Check "Perform tasks below if computer wakes up earlier" box. Specify the task you want WakeupOnStandBy to perform in the item (2) fields. INFORMATION: In case you want to run only one instance of the program precede it's path with an asterisk, e.g. *calc. This applies only to programs, though. Check all the days of the week in the item (4). [Optional] Check "Switch to tray" if you want to remove the WakeupOnStandBy window off the screen. Click "Start" button to activate. When completed the WakeupOnStandBy should be configured to run the task specified in item (2) when your system wakes up from a stand-by/Sleep mode or hibernation whether manually after a user interaction, or automatically at a predefined time. Since WakeupOnStandBy does not require installation, it is very simple to remove it from your system. For a quick overview watch this screencast. and select "Exit", or better "Exit All Schedules", if this option is available. If asked to confirm, select Yes. [This step is optional] If you set up WakeupOnStandBy to run through the Task Scheduler in Windows, make sure to remove it from there as well. [This step is optional] If you want to also remove the WakeupOnStandBy file itself, locate the wosb.exe file on your hard drive and delete it by right-clicking it, then select "Delete." INFORMATION: This is the file whose icon you would normally double-click to run the WakeupOnStandBy software. INFORMATION: In case you made any links to the WakeupOnStandBy program make sure to remove them as well. At this point WakeupOnStandBy should be removed from your system. Reboot it to make sure it's gone. For a quick overview first watch this screencast. To save your own time (and our time) please use the search function in your browser to make sure that your question was not answered on this page, and that it is not included in the software manual here. Read FAQ #32 below. It is incredible how many anti-virus software products are now out there. But unfortunately almost none of them can provide a true security they advertise. All they seem to do is catch and thwart "good" software that doesn't pose any risk for a user. Enable diagnostic event logging by clicking the "..." button in the WakeupOnStandBy program's main window, then pick "Settings." When Settings window comes up on the screen, switch to the "More" tab and check "Event logging of diagnostic events" box, and click OK. Right after the issue repeats, bring up the WakeupOnStandBy's context menu by either right-clicking its tray icon by the Windows clock, or by right-clicking on its main window, and select "Report Bug". This will bring up a new window. Click "Copy Report" and then "Submit Report." This will open our web page. Paste the report into it. Make sure also to describe the issue that you experienced. Be as detailed and specific as possible. Then click "Send" to submit your report. IMPORTANT: Please read this FAQ to make sure that our email response reaches you. When we receive your submission we'll process it in order received and will get back to you later. In the mean time, you need to perform one other essential step. Bring up the WakeupOnStandBy's context menu by either right-clicking its tray icon, or by right-clicking on its main window, and select "Export Event Log". This will allow you to save the event log file at the moment when the bug happened. Note again, that you have to do it as fast as you can after you witness the bug. After that keep the saved event log until we get back to you with our response. When you hear back from our support team, send us the export of the event log file that you made in the step before. Having done all these steps will greatly help us to isolate and fix the bug. We'll get back to you with further instructions, if any are needed. INFORMATION: Please note the we do not have resources to get back to you right away. Allow us at least a couple of days to address your issue. You will receive a response within two-week period. In case your issue cannot be resolved in the currently available version of the software we will try to correct it and include it in the next release of the software. This should normally take up to several months to complete. Reboot computer. That is the simplest thing to begin with. Try WakeupOnStandBy again after a reboot. If that works, this means that some of the system processes got fouled up while the system was running. Updates to the operating system, especially major ones, can disrupt one of your system drivers which in turn can lead to issues when the system tries to enter or leave suspended power state, such as sleep or hibernation. The solution is to update your chipset, video card and network drivers. Make sure to get those from the website of the manufacturer of the system, or said hardware. Antivirus software can block WakeupOnStandBy. Since antivirus software operates by constantly receiving updates from its server, something could've been changed in it that made it block WakeupOnStandBy software. The solution is to temporarily disable your antivirus software and see if it makes any difference. Any other power management software installed on your system that can receive automatic updates, or have a feature that can reset power settings, can potentially disrupt your power management profile. Note that most of the Windows power settings are global, meaning that one software changing them affects the entire system, or your Windows user account. The solution is to try to locate such software and temporarily disable it to see if it makes any difference. Additionally you may want to create a new Windows user account, log into it and try running WakeupOnStandBy from there. See if that works. INFO: By itself WakeupOnStandBy has no capabilities built into it to connect to our servers and change something without your knowledge. The only change that can happen is if you do it manually. Sure, thanks for your offer! Contact us via feedback. To answer this, one has to understand how hibernation works. To preserve all running processes (or open programs) the Operating System saves the context of each running process along with the contents of the volatile RAM memory onto disk and then puts the system into suspended power state (S4). Later on upon waking up, the contents of memory are restored back from the disk so that programs can resume. Over time some poorly written programs may leak memory. This is the term that implies a situation when a program reserves memory but fails to return it back. Such results in the overall amount of used system memory increasing, which is turn can affect hibernation. Additionally, some poorly written system drivers can become corrupted by (mis-)handling entering and leaving suspended power state. Try to check for updates to your chipset and video card drivers to fix this issue. Make sure to do so only at the website of the manufacturer of your system. The solution in either of these cases is also to reboot your system. Try to reboot at least once a week (or maybe even more often) to clear up the RAM and reset all running processes. The current version of WakeupOnStandBy is fully compatible with Windows 7. Download an update here. If you're unable to upgrade you may need to perform some manual adjustments to make sure that older version of the WakeupOnStandBy is capable of waking up your system on schedule. Note: You will need to perform the following steps only once for each Windows 7 system you're intending to use WOSB on. Since you're resorting to activate a suspended power state using a direct call to the Windows API, you need to fully understand all the parameters that are involved in that call. [You're looking at SetSuspendState WinAPI.] The third parameter (i.e. DisableWakeEvent) determines whether the system disables all wake events and has to be set to FALSE in your case. By using rundll32.exe to invoke system APIs you're technically skipping parameters of API calls, which can lead to unpredictable results. One of the correct ways to invoke suspended power state, is to use WakeupOnStandBy. Refer to the manual on how to use the WOSB's command line parameters. INFO: Assumes that WOSB.exe is located in the same folder where the line below is called from. Otherwise include the full path to the wosb file before it. INFO: Although on Windows XP system you can add an optional /force parameter, it is recommended to try first without it. No. Genuine WakeupOnStandBy (or WOSB as we also call it) is not a virus or a malware if you downloaded it from our web site. Having said that, I want to warn you that it seems like someone has created a malware with the name "Wosb1.7.9.exe" that is a virus, that may look like our WakeupOnStandBy executable. So how can you tell? Really simple check. Go to: dennisbabkin.com/wosb and that is where you can get a genuine copy of the WakeupOnStandBy utility that is absolutely safe. 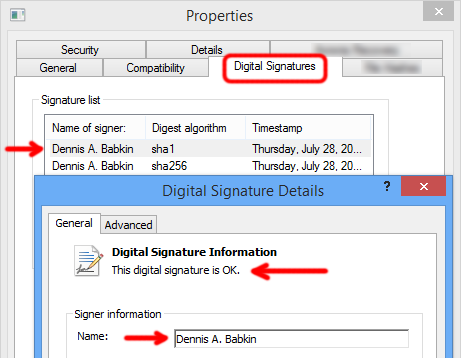 Additionally, when you first download WOSB, make sure that its wosb.exe file is properly signed. Here's how to check. And if it its not properly signed, delete that download, and please notify us. Translation is a voluntary work. You will not get paid for it. As the acknowledgement of your efforts though, we promise to include credit to the translator in the About window of the translated version of the WakeupOnStandBy program. You must be fluent not only in the language that you are translating to, but also in English. You must also be familiar with the WakeupOnStandBy program and with how it functions. Before beginning the translation, make sure to contact us and register your intent to translate. This is a very important step. The translation is a tedious process, and you wouldn't want to learn in the end that your translation is not needed because someone else has already been doing it for us. Only after you register your intent to translate the WakeupOnStandBy program with us can you be assured that your work may be used in the end. Make sure to watch our introductory screencast that will demonstrate how to do the translation. Download the translation package needed for the actual translation. Make sure to read and follow the rules of translation outlined in the INSTRUCTIONS file inside the translation package. Keep in mind that if you deviate from these rules your translation may be rejected! We'd expect you to finish the translation within a reasonable amount of time. It is also important that you keep us informed on your progress. Not being able to contact you will result in the cancelation of your translation intent. 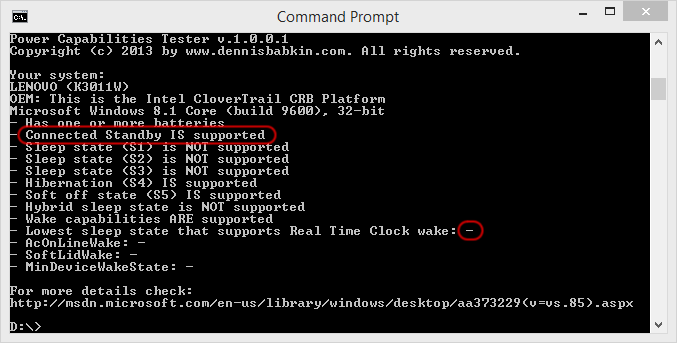 WakeupOnStandBy cannot and should not be running from the Windows Task Scheduler. The latter one is a scheduler in itself, and combining the two is like running two antivirus programs on the same system - it does not make sense, and does not work. If you like using the Task Scheduler then don't use WakeupOnStandBy, and vice versa. They both provide equal set of options, although in our view, the WakeupOnStandBy program is less cumbersome to use. But again, it's entirely up to you... just don't mix the two! WakeupOnStandBy cannot run as a service, or wake your system without any logged on Windows users. This is the limitation that comes from the Operating System and has nothing to do with our software. To make it work we need to design it as a service, that will involve a whole host of additional steps that a user needs to perform. That won't make the WakeupOnStandBy program as simple to use as it is now, and thus we chose not to do it. Note that we provide a paid option for the corporate and enterprise users to program a customized module with that capability. Read more here. WakeupOnStandBy cannot wake every single computer from a suspended power state. To make you better understand why, let me say that the WakeupOnStandBy program does not do the waking (so to speak) itself, instead it relies on the Operating System and your hardware (chipset) driver to do the job. So if the latter one fails, the operation fails as well. And there are millions of hardware configurations that exist out there to work flawlessly. Make sure that you check this question, and if that didn't help ... sorry, you might be out of luck here. WakeupOnStandBy was designed to provide basic power saving capabilities for home and small office users only. If you're attempting to run it in your corporate or enterprise environment, you must realize that the free version of the WakeupOnStandBy program was not designed for your environment. Refer to this question for more details. Still, if you believe that you're experiencing a bug in our software, check this question for the explanation on how to submit a bug report. It is also important to know how to configure your email client (program) to receive a response from us. You would be amazed how many emails that we reply to, bounce back only because your email server does not like our email address. The emailing business is very unreliable, so please keep this in mind. To make sure that you can receive our email responses add our domain @dennisbabkin.com into your email client's trusted list. Also make sure to check the spam folder, as it seems to be all too common that new emails are put there by some "extra zealous" email providers, especially if your company runs their own email server. As a suggestion, get yourself a good free email account at Google's gmail.com that should work fine. One sure way to guarantee a two-way communication is to direct-message us on Twitter @dennisbabkin, or message us on Facebook. Any requests to list your website on our web pages will be ignored. We do not run commercials of any kind. If you need permission to post our software on your website, or publish it in your magazine, or include it on a CD/DVD/media disc that comes with it, you have our permission to do so. Make sure to take the software from this page. And lastly, if you sent us a message and we haven't gotten back to you, this means that something went wrong. Please try sending it again, after having set up your email client as was described above. Also, try using any of the alternative email addresses than the one you used originally. There are two answers to this question - a short and a long one. The short answer is: Sorry, WakeupOnStandBy cannot wake a Windows 8 device on schedule, if that device supports Connected Standby or "Always-On-Always-Connected" power mode. And here's the long answer. Since Windows 8, Microsoft introduced the new power mode that they called Connected Standby, which in theory was supposed to make your portable device run as a smartphone, or to be always ready at the flip of a switch. Hardware manufacturers supported it with their low-power CPUs (starting with the Intel® Atom™) that were designed with the requirements of the Connected Standby in mind. Use any of the Modern UI or Metro apps, available from the Windows store. They will most likely not be compatible with your desktop applications, but at least they will wake your device on schedule. Post script: I know that I haven't given a helpful answer to people seeking the way to resolve the issue with wake capabilities of desktop applications on Windows 8, but, hey, don't blame developers. We're as hamstrung by Microsoft's aspirations to copy other (successful) tablet and smartphone makers as the regular users of their operating system. Let me start off by saying that in most cases if your computer wakes up when you did not expect it to, this does not happen because of our WakeupOnStandBy software. Still, to make sure that you eliminate such possibility, the first thing to do is to make sure that you have the latest version of the WakeupOnStandBy software installed. You can get it from here. Next please read through the WakeupOnStandBy software manual to make sure that you set it up correctly. Or, if you're not into reading, you can watch these screencasts for a brief overview. Then let's see why your computer may wake up when you did not expect it to. The most common culprit is the setting in Windows that allows devices to wake your system from suspended power state (i.e. sleep or hibernation.) And the most common device to do this is your network adapter. For the legacy purposes it may still be configured for so called WakeOnLAN event, that, if not used, may be the reason why your system wakes up at random times. Another culprit could be your mouse, or any other external pointing/drawing device that is configured to wake system up. First let's see what can wake your system. There are basically these reasons why your computer can wake up by itself: A) Wake timers, that can be set up by WakeupOnStandBy or any other scheduling software, B) Wake devices, as I described above, C) Windows Task Scheduler tasks, and D) Buggy or incompatible drivers. This will show you the latest wake source and wake time, that should most likely hint onto what woke your computer. To see additional wake-related information, such as wake timers and wake devices, click "Wake Devices" button. Alternatively, we have a small utility called "Power Capabilities Tester" that can help you retrieve that too. INFO: "Power Capabilities Tester" tool is built into WakeupOnStandBy since v.1.7.20.3. 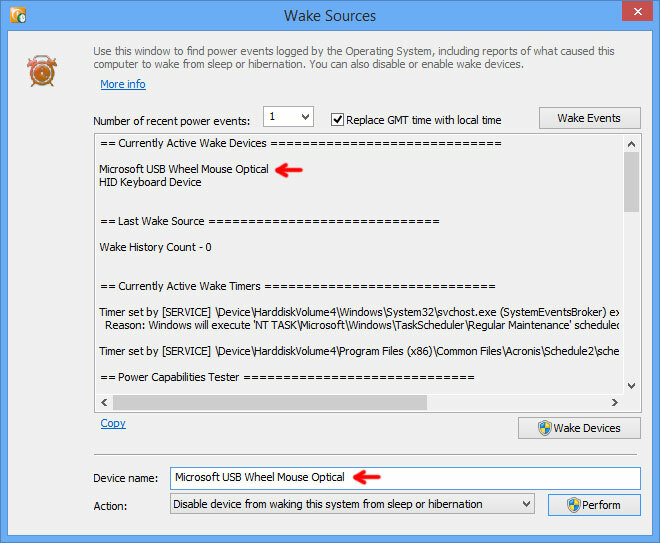 Its reports are included in "Wake Sources" window shown above after you click the "Wake Devices" button. INFO: It is suggested to run this tool as administrator to enable it to generate a report for all available tasks. Having this information (shown with red arrows) you can decide what to do, i.e. 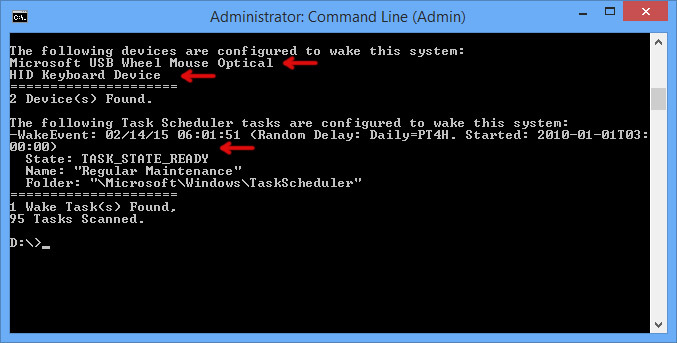 either disable the Task Scheduler tasks that are shown, or disable listed wake devices. To disable Task Scheduler tasks, type task scheduler in the Start menu search bar and run the Task Scheduler application. Then navigate to the task(s) shown in "The following Task Scheduler tasks are configured to wake this system" section in the report in the "Wake Sources" window after you clicked "Wake Devices" button, or alternatively provided by the "Power Capabilities Tester" tool in its "Folder" and "Name" fields. Then either disable, or delete those tasks. Keep in mind that some scheduled tasks may be crucial for the operation of other software and some Windows components. If you do not want to disable or delete tasks, open them up for editing (by double-clicking on them), then navigate to the "Conditions" tab and uncheck "Wake the computer to run this task" and click OK to save changes. Having done that, reload the "Wake Sources" window and click "Wake Devices", or re-run "Power Capabilities Tester" tool, to make sure that the task is no longer listed. Then click "Wake Devices" button to see the list of wake devices on your system. 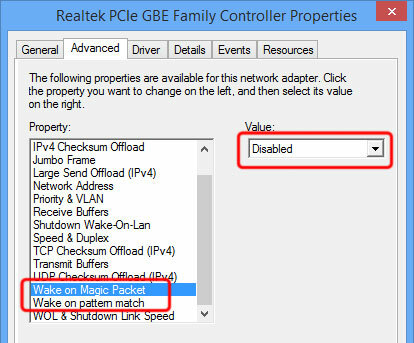 Copy the name of the wake device from the report, paste it into the "Device name" box, select the drop-down option below to disable it, and click "Perform." This will disable that wake device. Repeat for any additional wake devices that you'd like to disable. where "device name" is one of the names of devices that you got from running the "Power Capabilities Tester" tool. where "device name" is again, one of the names of devices that you got from running the "Power Capabilities Tester" tool. For a complete list of available commands check this Microsoft document. Then right click that item found and select "Run as administrator". Alternatively you can right-click on Computer in your Windows Explorer and select Manage. In the "Computer Management" console go to Computer Management -> System Tools -> Device Manager. When Device Manager is displayed in the middle pane, go through each and every device in the list, by double-clicking on the name to check its properties. Lastly, I would strongly recommend checking for an update to your chipset and video driver. Such update will not be delivered via your usual Windows Update portal, and instead should be checked specifically at your computer manufacturer's web site. (For example, if you have a Dell computer, you will need to check for updates at a Dell web site, etc.) Look for a chipset, logic board, or motherboard driver update, and if such is available, download and install it. Please be careful though to download it only from the website of the manufacturer of your computer! Also make sure to carefully follow instructions on how to install such update, as a bad chipset driver may render your system unusable! The fix in this case is pretty straightforward - make sure to upgrade your motherboard/chipset and video drivers. For that go to the website of the manufacturer of your computer and download an update to the chipset & video drivers that are compatible with Windows 10. (For Microsoft directory of vendors, click here.) Then reboot your system. If the driver is compatible with Windows 10, our WakeupOnStandBy utility will be able to wake your system on schedule as it did before. If, at an odd chance, your system still cannot wake up from sleep (or hibernation) make sure to check FAQ 41 and FAQ 19 for more details. When "Settings" window comes up, switch to the tab that reads "More." Check "Enable logging of diagnostic events" in the Event Log section. At this point when you run WakeupOnStandBy it will record its actions in the diagnostic event log. To view the contents of the diagnostic event log, right-click the main WakeupOnStandBy window and select "Open Event Log File." Or, if you need to send a copy of the event log to our support technician, select "Export Event Log File" and pick the location to export it to (for instance, your Desktop) and click OK. This will create a ZIP file with the diagnostic event log inside that you can attach to your email response to our support technician. For additional options check the software manual.